All VIPER cleaning machines which will enter the EC are tested and approved against the CE rules by SLG Prüf- und Zertifizierungs GmbH. The CE-declaration is published in our Quick Start Guide manual, which can be downloaded for each product. 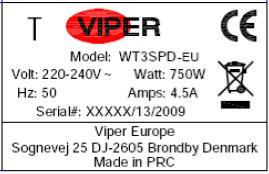 Every machine has a label showing the serial number and year of manufacture, as well as the CE seal, weight, power, model, amperes, voltage and Hertz. The CE-declaration is required for any apparatus put into service in any EC member state, whether imported into the EC or manufactured in the EC, by the company who sells the equipment on the market. The declaration should be signed by a responsible person, at the point of entry to the EC. It states that the apparatus complies to the requirements of the directives as stated on the declaration, following the standards as indicated. An apparatus that has been ce-marked, without any declaration available, makes the manufacturer or importer liable to more severe punishment as when he declares without fulfilling the technical requirements. Therefore, a declaration is absolutely necessary. It does not have to be available immediately, but must be produced within a reasonable time. ​ ​ Two versions exist for respectively declaring acc. to Harmonized Standards (10.1) and for use with a Technical Construction File (10.2). The declaration does not have to be based on compliance test reports, but may be based on other compliance information. Obviously, testing and generating reports is the most reliable way of generating this information.